Answers to Quora questions. 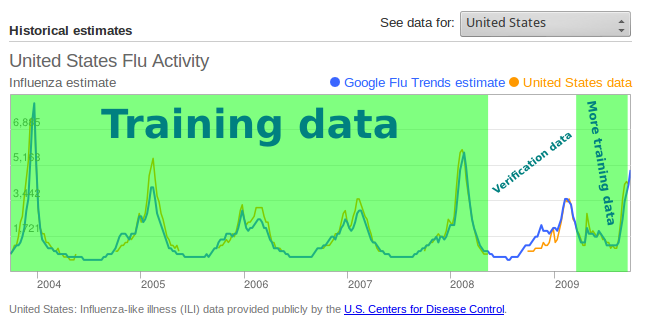 : Q: How accurate is Google Flu Trends? 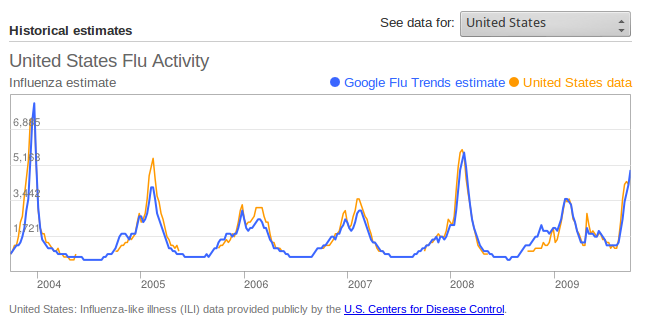 Q: How accurate is Google Flu Trends? Update March 14, 2013: In 2012–13, Google Flu Trends did not successfully track the target flu indexes in the U.S., France, or Japan. Here are my slides from a talk at the Children's Health Informatics Program (March 14, 2013). I did an interview with WBUR's CommonHealth blog in January and again in February, and spoke on the radio in January. 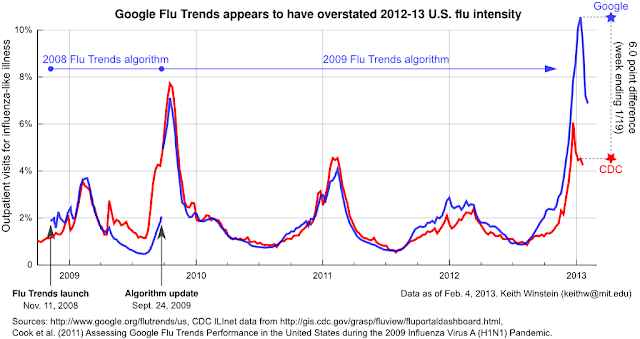 Summary: At this point [Feb. 4, 2013], it appears likely that Google Flu Trends has considerably overstated this year's flu activity in the U.S. But we won't be able to draw a firmer conclusion until after the flu season has ended. I don't know why the model broke down this year but am eager to learn, when and if Google comes to a similar conclusion. For now, I suspect this episode may provide a cautionary tale about the limits of inference from "big data" and the perils of overconfidence in a sophisticated and seemingly-omniscient statistical model. I am not an expert on the flu and you should not make health decisions based on Quora. You should get vaccinated, wash hands often, cover a cough, stay home from work if sick, and follow the CDC's advice: Seasonal Influenza (Flu). By contrast, on Jan. 20 Google had finalized its prediction for the same statistic: 10.6%. This 6.0-percentage-point difference is larger than has ever occurred before. Google's scientists quite properly point out that the CDC will adjust its data retroactively, as more data comes in for past weeks. Thus the "red line" on the above graph can change over time, whereas the "blue line" is locked down in all but its very last data point. However, the CDC's adjustments have been modest so far, and even for recent weeks where the Google-CDC divergence is very large, the total number of sites reporting to the CDC has now reached close to the most it ever hits. Further dramatic revision of those data points seems unlikely. In my nonexpert view, at this point there is little chance that Google Flu Trends's estimates can somehow be vindicated. A similar episode happened in 2009, causing the previous tweak seen above. Some of their approach may need to change if they want these divergences, repaired only after the fact, to happen less often. Why the model did not work this year is an exciting mystery, and I am eager to learn the answer, when and if Google reaches a similar conclusion that something went awry. Did one or two of the 160 search queries dramatically increase in popularity? Or was the effect seen over all 160 queries used in the model? Did Google's decision not to retrain the model since 2009 make the difference? If they had retrained the model knowing what they knew in mid-2012, would this season's estimates have been better or worse? Were there hints last summer that, in retrospect, suggest they were mistaken not to retrain the model, and if so can those hints improve the decision process for retraining in the future? Can we evaluate the effect of different retraining policies (e.g. retrain every year, retrain every month vs. the current policy of retraining only on certain triggers), and how they balance various risks? What should the triggers be? Is it possible to estimate flu intensity using queries chosen by a computer without human intervention for their retrospective accuracy? 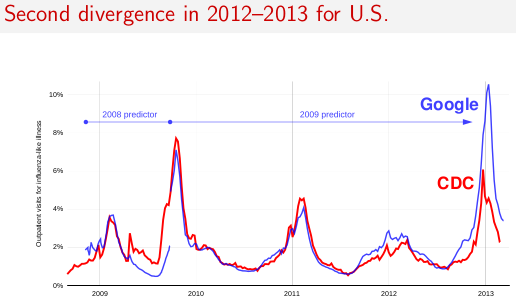 Would the predictions be better if humans intervened to make sure every query made sense as a flu predictor? Or would this simply introduce more problems? The promise of real-time disease-activity estimates is a valuable idea that has the potential to save lives. Google is the most sophisticated company in the world at this kind of inference, and the fact that even they can apparently stumble suggests that this is really, really tricky. I hope Google improves their technique and continues to attempt it. I'm happy to help them in any way if they could use it, but I doubt they will need me. The graph shows a "hindcast" from Google's "2009" Flu Trends predictor, the one launched in September 2009 just after the end of the plot. No data point on this graph was actually displayed to the public as a contemporary estimate. From the launch in November 2008 until the end of this plot, Google displayed predictions from the "2008 algorithm." The data from that algorithm is no longer available from Google's site; I had to trace it from a bitmap image that Google submitted in a scientific paper to PLoS ONE about the algorithm's difficulties in 2009 and subsequent improvements (Assessing Google Flu Trends Performance in the United States during the 2009 Influenza Virus A (H1N1) Pandemic). 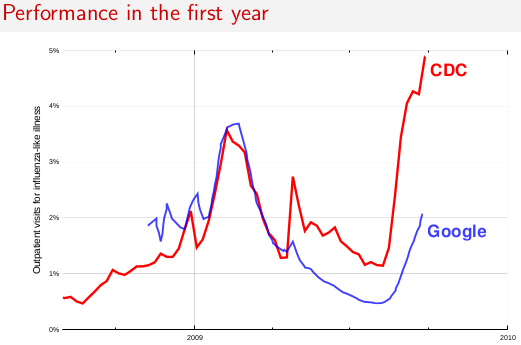 Although the data shown is from the "2009" algorithm, the only reference Google gives is to their earlier scientific paper about the 2008 algorithm, published in "Nature" (http://research.google.com/archive/papers/detecting-influenza-epidemics.pdf). There is no mention of the later paper or the change in algorithm. In the Nature paper, Google reported that the 2008 algorithm had a 97% mean correlation with the CDC data on a held-out verification set, which is a fantastic result (even higher than the 90% that Google had achieved on their own training set!). 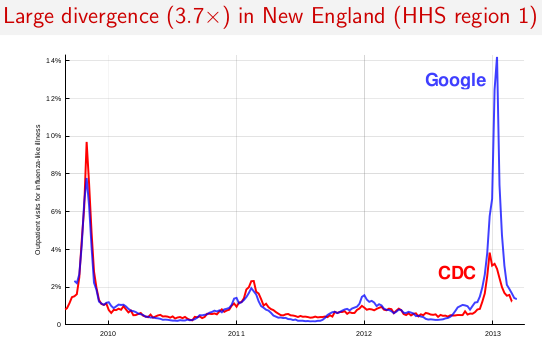 In the PLoS ONE paper, published three years later in a less prestigious venue, Google reported that the 2008 algorithm's actual correlation with the first wave of early-2009 "swine flu" was only 29%. I have heard cynics hyperbolize that the purpose of Nature is to publish fantastic-seeming results so that they can be debunked under subsequent scrutiny by less-prestigious journals. It's depressing to see a case where that was somewhat realized. Although Google wrote in the PLoS ONE paper that "We will continue to perform annual updates of Flu Trends models to account for additional changes in behavior, should they occur," and a similar statement in the Nature supplement, in practice Google has not updated the algorithm since September 2009. As they write below, they determined that an update wasn't necessary. But they could make this more clear -- as well as discussing how they determine whether or not to update the model -- in their papers and Web site. The fact that Google decided not to update the model for 2012-13, and subsequently the model performed poorly in 2012-13, suggests that the procedure for deciding when an update is necessary may need to be reworked. On the other hand, it's possible that even if Google had updated the model, the divergence would have been just as bad (or worse). 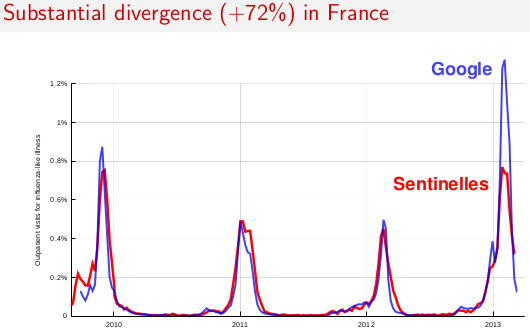 The difference may mean different things for how Google Flu Trends can be improved in the future. These are questions I sincerely hope Google examines and answers in a future scientific paper or Web site update. Thanks for your valuable answer. I clearly understand about google flu trends with your answer. Thank you. Join FITA has offered quality Python Training in Chennai at affordable price with help of highly skilled faculties having more than 7 years of experience in Python, for more details about this advanced python training call at 91 98403-76887. If you have any idea about that and you have the secure and efective way to send files through socket I'll appreciate that. Buzz Applications is offering website for your product or your company!! That is it! You are currently sending SMS upgrades!SMS Marketing Applications On the off chance that you need to change settings and alter the SMS messages that are sent, keep perusing. I learned some new information. Thanks for sharing. EXcellent posts thanku for sharing.. I use this service https://www.intistele.com/blog/get-started-with-sms-marketing/ when I need to address several issues that are important to keep in touch with the client, not to lose it. Often I am using discounts on birthday. A good tip to stimulate demand. it is very usefull inforamation thanq..telugubullet.com also a super site for latest telugu news updates. If you are really looking for a genuine advice and suggestion for Yahoo issues, you can dial a Yahoo Customer Care to have any kind of suggestion. Their suggestions and advices are free, so you can find any time with their toll-free number. an article in Science magazine titled The Parable of Google Flu: Traps in Big Data Analysis exposed Flu Trends’ use of faulty data collection methods for the 2012-2013 flu season. The article called the program “big data hubris,” for overestimating doctor visits for the flu compared with CDC reports. “Quantity of data does not mean that one can ignore foundational issues of measurement and construct validity and reliability and dependencies among data. The core challenge is that most big data that have received popular attention are not the output of instruments designed to produce valid and reliable data amenable for scientific analysis,” the authors of the Science magazine wrote, which led to dozens of media reports questioning the relevancy of Flu Trends. Thanks for sharing the Informative article. Your blog is very interest about the Google Flu Trends, Perfectprofile.net is a leading Job Portal in india. if you want etl testing jobs in hyderabad please go through this website. really you have shared very informative post. the post will be helpful to many peoples. thank you for sharing this blog. so keep on sharing such kind of an interesting article. I understand the trends of google flu trends.This blog is very useful to me.The information you provide is very nice.Thanks for sharing. Thanks for this valuable information.I was really learn about content.If you want walk-ins in hyderabad for etl testing fresher’s.check this site. In case you are not able to give the permanent fix to the particular issue, you need to immediately dial Gmail customer support 1-800 phone number for live chat. The phone number will give the quick response for the particular trouble in your Gmail account. Just get in touch with Gmail customer care experts and obtain the splendid solution. I really enjoy simply reading all of your weblogs. Simply wanted to inform you that you have people like me who appreciate your work. Thanks .. In case if your Yahoo email account is not working responding properly and you are finding for instant resolution then you can rely on us. Simply pickup your phone and dial Yahoo customer service helpline number which is toll-free. Hi, I have read your blog. Really very informative and excellent post I had ever seen about Python. Thank you for sharing such a wonderful blog to our vision. Learn Python Training in Chennai to know more details about this technology. This information useful who search for CCNA jobs in Hyderabad .So we need this information.Thank you for sharing this great post. Hi admin.., I read your blog completely.I Gather lot of information in this blog that information will help me develop my knowledge. Thanks for sharing. keep sharing more blogs. Skype is very useful and power full software and it will be good for personal or official work. You can use Skype for texting, sharing data, audio call, video call, video conferencing and much more or If you want skype setup in your window 10. Than this is your guide. If you face any problem don’t worries! contact with us and visit our website us they are available 24*7 to help. If you're unable to merge your Pages, it means that your Pages aren't eligible to be merged. And if you don’t have any solution to facebook page merge so doesn’t worry we help you to solve this problem visit our website or contact with contact service team. Make sure the one you're trying to call is using the facebook messenger app and is in your friend’s list. If your friend is active and when you call them it displays connecting and then ringing. But you don’t know how to connect with your friends so visit our website or call customer support team. Really fantastic. you are really a skilled blogger.I like your post very much.Thanks for sharing.keep sharing more blog. Its a fabulous blog i have ever read in past days. search jobs near by you in chennai. Thanks for everything. Anybody who wants support for Facebook related issues, call at Facebook contact number 1 (407) 965-2136. Wow, I'm really impressed by this website, not only does it look good, the posts are super interesting too! Subscribed! By the way, if you need hep with singapore company incorporation, let us help, we are the best business incorporation assistant. register a business immediately! Informative post about hadoop, i am looking forward for realtime hadoop online training institute. Thank you for this Useful Blog! I have read your blog its very attractive and impressive.I like it your blog. Data Mining Project Centers in Chennai | Secure Computing Project Centers in Chennai. IEEE Electrical Projects in Chennai | IEEE Php Projects in Chennai. usefull article about "How accurate is Google Flu Trends". thanks for sharing. Thank you sharing this wonderful information. Nice Post. Thanks for the wonderful information were given here and thanks for sharing. good work done and keep update more.i like your informations and that is very much useful for readers. In the beginning, I would like to thank you much about this great post. I like your writing style and I hope you will keep doing this good working. Your blog is very interesting to read. Keep sharing this kind of worthy information.